Viz Reflectives Case Study from Viz Reflectives on Vimeo. 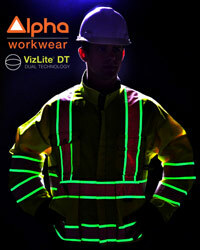 VizLite Dual Technology is a revolutionary new system combining VizLite 20471 Reflective material and photo luminescent pigments into one sew on product that is designed to offer an extra element of visibility to High Vis and none High Vis garments. VizLite Dual Technology meets all international standards such as EN ISO 20471:2013 and ANSI 107:2010. The patented technology developed by Viz Reflectives over the last 12 months will bring a new generation of visibility to the market giving the wearer extra protection in low light or in dark areas. 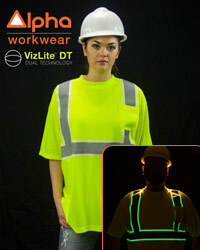 Testing has now been completed for the majority of the VizLite Reflective tapes to the new standard for High Visibility warning clothes in Europe, EN ISO 20471:2013. New certificates are now available for 100, 201, 201HA, 201HA CUT, 205 IW, 301 IW, 305 and 310CP Reflective Tapes upon request. New EN ISO 20471 certificates for Vizlite 100N, 302 and 306 and to follow later this year. Also recently completed at Shirley Technologies Test House was the renewal of Oeko-Tex certificate 11-30823 to product class 3 of Vizlite 100,200E, 301,302,303,305,306 and 310 reflective tapes. VizLite tapes 201, 205, 206 and 201 HA have now been certified to Oeko-Tex product class 2 for materials that have direct access to skin. The new certificates are available upon request and new product literature which details the above will soon be available.